Workout experts say that recovery is a critical component of any successful workout program. However, workout enthusiasts will tell you that recovery can be a tricky process that can be hard to achieve at times. Fortunately, there always seem to be a new method that ensures a quick and more comfortable recovery. Today, the talk is centred on cryotherapy as an effective recovery method that suits almost everybody. But, what is cryotherapy and how does the cryo chamber work? Read on to find out. 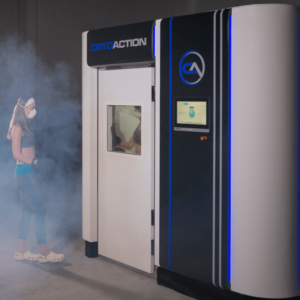 How Does the Cryotherapy Chamber Work? When you step into the cryotherapy chamber, your body undergoes some sort of transformation. When you step into the chamber, the temperatures drop drastically to unimaginable lows for a few minutes. However, the treatment and recovery process is quite straightforward. When you step into the cryo chamber, the temperatures drop to as low as -1840F with the help of liquid nitrogen. Once the temperature drops, you are expected to remain in the chamber for at least three minutes before you step out. Scientifically, this is concentrated and localised treatment method that is quite effective and more comfortable than jumping into an ice bath. In theory, the cryotherapy chamber is like a bigger and colder version of a typical ice bath. Once you step inside the chamber, the dry cold penetrates through your skin causing your body temperature sensors to send a quick signal to your brain which triggers a fight or flight response. When your brain sensors sense the extreme cold, it causes blood to flow to the torso to insulate and protect all the vital body organs. Once you step out of the chamber, a lot of oxygenated blood starts to rush to the body organs which help with the healing process. In theory, this makes sense, and that is what most people believe that happen. Although this recovery method is still relatively new in the UK, it has been in use since the 1970s in Japan. Some people who suffer from severe joint pain, rheumatoid arthritis, and even depression claim that whole body cryotherapy help in alleviating their symptoms. Athletes also claim that cryotherapy helps to improve their performance since it speeds up muscle recovery. Various studies have also proved that cryotherapy has an overall positive effect on soft body tissues and tend to slow down muscle soreness.